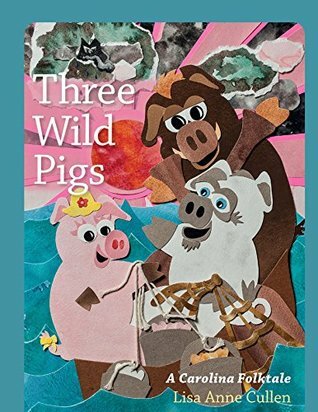 The three wild pigs are fishing in their boat off the Carolina coast, when a hurricane begins to blow in from the sea. They scramble back to shore and hunker down in their homes of dune-grass, thicket branches, and strong conch shells. The voice of a wolf is heard on the winds of the storm, as the wolf-winds try to blow down the homes of the pigs. Together, they survive the hurricane winds and the rising waves, despite the howling wolf-winds. I liked the story of these three wild pigs! There is a lovely fluidity to the pacing, and there are lots of little details that make the narrative special. Especially important to the story’s roots is the repetition of lines like “I’ll huff and I’ll puff,” and “Not by the hair of my chinny-chin-chin.” The author takes this to a new level by adding in repetition of new lines like, “This is my home. I’ll be okie-pig-dokie.” As each pig determines to stay in their house and brave the storm, the line is repeated by each of the characters. I loved the continuity this gave to the story! I did not like the art style of cut-out pieces of paper. It looks too busy, and it’s difficult to tell what is really happening in each scene. The colors are too jumbled and it lacks clarity. I was often confused about what the characters were doing or where they were. There is also a strange cartoon included on a few of the pages with a word puzzle illustrating how to pronounce the word “cumulonimbus”. The clouds of the hurricane are being described in the story, and the little word puzzle is included each time the word “cumulonimbus” is used. It looks strange and out of place, and it serves no purpose in the story. I thought it was very odd. I liked this little retelling with a strong coastal flavor, but I really did not enjoy the art.